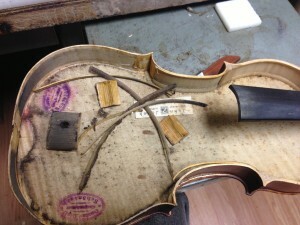 Today we received a violin from a women who’s house had caught on fire…she came in with black hands and a violin and 2 bow’s that where soaking wet and smelled strongly of smoke, she said they violin was her grandmother’s and asked us if we could restore it..The violin itself was falling apart, the ribs where coming unglued and changing shape, the lining and corner blocks had already come unglued and where just rolling around inside the violin, we quickly clamped the ribs in place so they would not lose their shape anymore, we clamped it as best we could, then we took the frogs from the bows and dried them, then we let it air dry in the shop for about 2 weeks…before we began the restoration…. 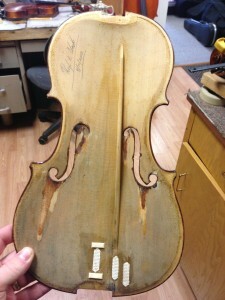 After letting the violin dry out, i removed the top of the violin to see the full extent of the damage. 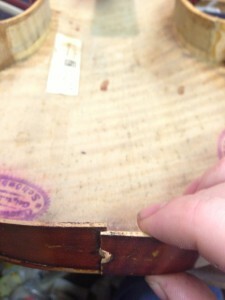 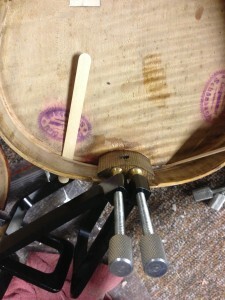 the top plate had 2 small cracks and the center seem had started to separate, the two back corner blocks had come off, and all the lining on the C bouts and lower ribs had come off as well as the end block, and the bass bar had come halfway unglued. 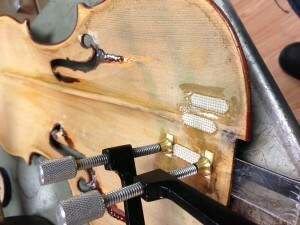 We started by gluing the the cracks and center seem, one of the cracks ran up under the bass bar so we needed to clamp and glue them back together, I glued the center seem and other small cracks and clamped back together, and i also glued and clamped the C bouts, i had to clean the dirt and old glue with hot water and a horse hair brush before i could re-glue them and clamp in original position. 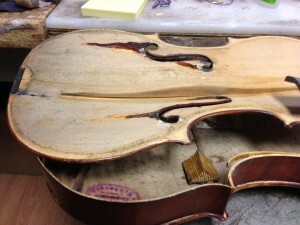 I let it sit and dry over night, in the morning removed clamps and added a 2 “cleats” to the center seem to help strengthen it form coming apart in the future, i added some cloth strips soaked in glue to the other cracks to strengthen them as well. 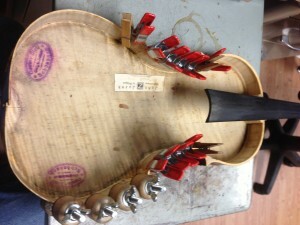 After that i glued the the lining back onto the C bouts and glued the corner block’s back in to place and clamped to dry. 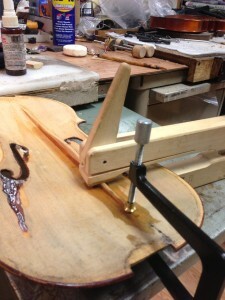 While the lining was drying, i cleaned under the bass bar and glued and clamped it back into original position, the bass bar when the violin is made is meant to apply some pressure to the top plate, and give it more strength, it dose not need many clamps because of the pressure one or 2 clamps is all that is needed. 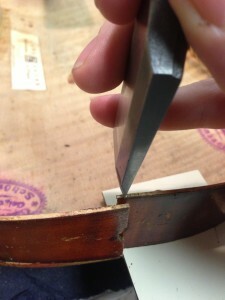 I removed clamps in morning and started work on the end block area, because the wood had changed shaped a little the position of the rib’s had changed, so at the end block we had to trim the ribs to make them fit, they over lapped maybe 2 mm i trimmed with a chisel evenly to keep the center line the same. 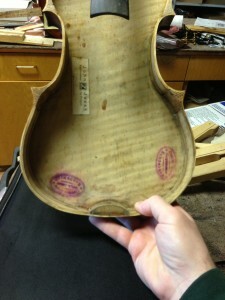 After trimming to fit and match the center line, we first glued and clamped the end block back into position let it dry for about 3 hours, while that was drying i trimmed the lining to match the smaller ribs, and glued them back into position to help the ribs hold their shape before gluing to the end block, after they both had dried i glued the ribs to back to the end block and clamped into position. 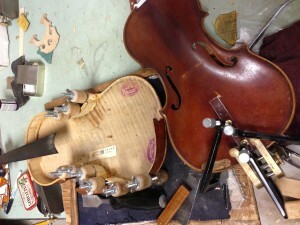 We allowed this to dry overnight, next day we cleaned up any excess glue in preparation for placing the top plate back onto the violin, then we glued the top back onto the violin. 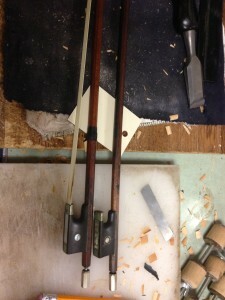 We let it dry overnight, while it was drying i started work on the 2 bow’s that came in with the violin, both had minimal damage, they both needed to be rehaired, new leather and the stick’s needed to be cleaned and a french polish applied, the frogs also needed to be cleaned, lime had started to build up on the metal fittings. 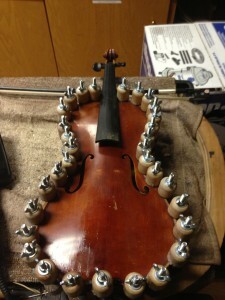 After the cleaning and french polish i installed the full leather thumb grip and winding as it was before it was damaged, then i rehaired both bow’s. 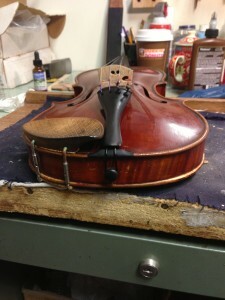 Next day i continued work on the violin, removed all the clamps and cleaned off ant excess glue, The i started cleaning the smoke and water from the varnish, first with a damp cloth, then with some cloth sandpaper and water, after cleaning i polished with oil and the cloth sandpaper, then applied a french polish to the front back and sides of the violin, French polish uses a small amount of shellac and oil on a soft cloth with a cotton ball placed inside and tied into a ball, this will give the violin a shine and also protect the varnish, i applied 2 coats of french polish set it to dry for 2 hours, then i cut a new sound post and placed inside the violin, the old bridge had warped badly from the water so i had to cut a new bridge, then i cleaned the peg box and scroll, and installed new strings and a new tailgut. We did all we could to not add anything that was not necessary, and restore the violin as close to it’s original state as possible. 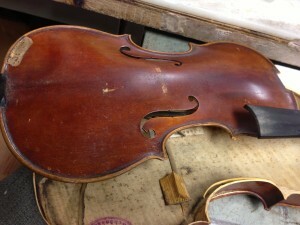 Restoration require’s lots of patients and a steady hand to complete, some of the techniques i did not show in the pictures or explain because of shop trade secrets. 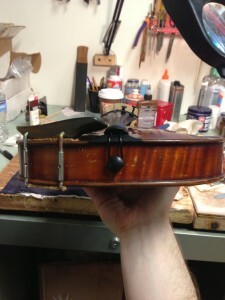 i do not recommend anyone try these repairs without professional training as it takes allot of practice to and training to complete without damaging the violin. 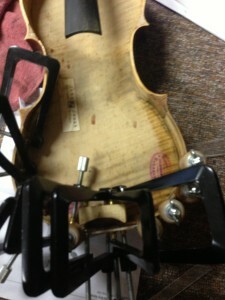 we also replaced the chin rest with a ebony one. 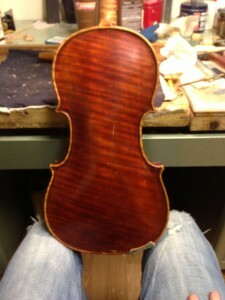 the violin itself looking at it is very hard to tell it has been repaired or was ever in the poor state that it was. 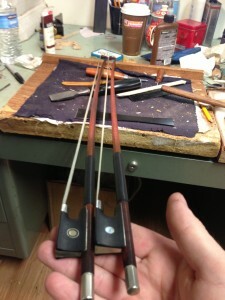 there are techniques we could have used to bring it back almost perfect to its original state but these would require much more time and money, and would involve making different molds and clamps, and much more varnish work. 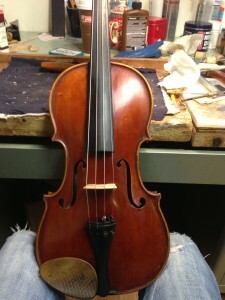 For the customer and the quality of the violin i chose to do it this way so the repair cost’s do not exceed that of the value of the violin itself.